There are few food pairings that are as perfect as figs and cheese! So we’re sharing some of our favourite recipe ideas that bring these two wonderful foods together in one dish. Fresh or as a paste, figs are always a welcome addition to any cheese plate. But because figs are delicious either fresh or cooked and work so well as a savoury accompaniment it’s worth considering adding them to any number of dishes that feature cheese of some variety. Try adding some figs and blue cheese to a simple rocket salad, dressed with some balsamic glaze and roasted walnuts. The sweetness of the figs works in perfect harmony with the earthy mouldiness of the cheese and is rounded out with the peppery hit from the rocket and bite of walnuts. Who doesn’t love a fabulous pizza with it’s crunchy crust and cheese covered deliciousness inside? Why not try something a little different by adding figs to the mix? Figs are wonderful with caramelised onions, pancetta and rocket or all of the above! When it comes to cheese, you can take your pick from brie, ricotta, goats or mozzarella – you really can’t go wrong there. You can’t really go wrong with a cheese tart and adding figs to the mix is the perfect addition. 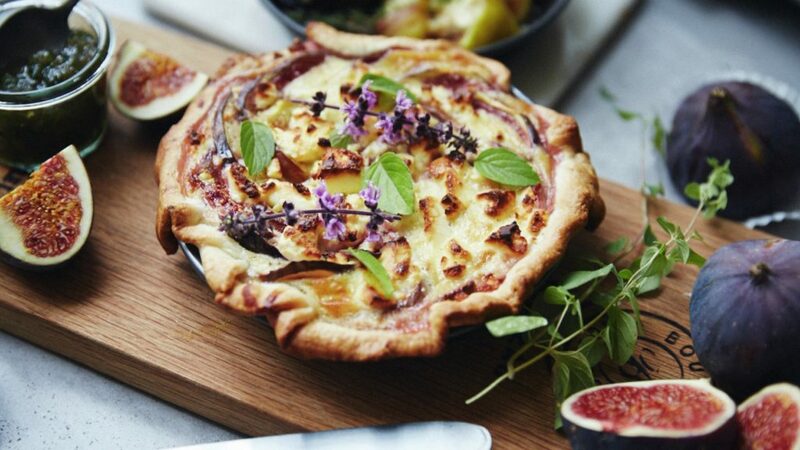 Once your tart is filled with either goat’s cheese, mozzarella, cheddar or feta, gently place sliced figs into the tart and bake until golden. The figs will caramelise and the sweetness will balance out the cheese perfectly. For the sweet tooth in the family, try glazing or honey roasting some figs and serving them up with a delightful mascarpone… be sure to drizzle extra glaze (or honey) over the top before serving! There really is no end to recipes that pair figs with soft cheese so get experimental in the kitchen and be sure to share your creations with us on Facebook or Instagram.